Many of you have asked me to write about the bedtime routine around here, so I avoided it and avoided it, but I guess it's time to divulge. Now I far from claim to be doing the right thing, we are just doing what's working for us at this point. With two kids on two very different programs and schedules, it's really a bit of a sh*t show, but at least we're each only playing one on one! Basically we do our best to eat dinner around 6:30/7p (we do bath time for Avi before dinner so she's a little tranquil and ready for the evening). Any later than 6:30/7p for dinner and Avi is ready to eat her arm off and is a big grump. After dinner I do a little clean up and try to get Bar into the bath around 7:30p. She splashes around and gets all the rest of her energy out and by the time I pull her out and get her dressed for bed she's beyond ready for sleep at 8p. I give her a nurse then a bottle and she's out cold. Oh and before the milk part of the evening, I've been giving her homeopathic tablets for teething and sleep aid as of recently since she was in the habit of waking up a few times in the night...I think her teeth were hurting and waking her up. It's been helping. Meanwhile, Richie let's Avi watch a little TV to wind down and takes her in to her bathroom around 8:30p (often it's closer to 9, but that's way too late for her...she gets overtired and cranky and doesn't sleep as well). She brushes her teeth and makes sure to pee before bed. Assuming it's not too late he reads her a book (sometimes I swoop in at this point if she'll let me and the baby's went down quickly). Then we shut the lights and lie with her. Richie usually stays 10 minutes or so and leaves her to fall asleep on her own. I'm a sucker and stay 'til she's sleeping since I often feel guilty that Richie always does her bedtime and it's a rarity that I can do it. On a good night they're both asleep by 9/9:15p and we can drink some tea (green with peppermint is our nighttime have) and watch some HBO or whatnot together. Often it gets complicated by family events or weekends away, but the routine is a relatively new thing for us and working really well. With Avital we always went with the flow and put her down when she seemed tired. She hung well and didn't breakdown too much. Bar on the other hand is a creature of habit and freaks a bit when off schedule. It forced us into a routine and, to be honest, although it was never my style, there is a comfort in knowing when everything is going to go down and in what order. That said, anyone can wake up at any point in time. Often by 6a we find both girls in our bed. 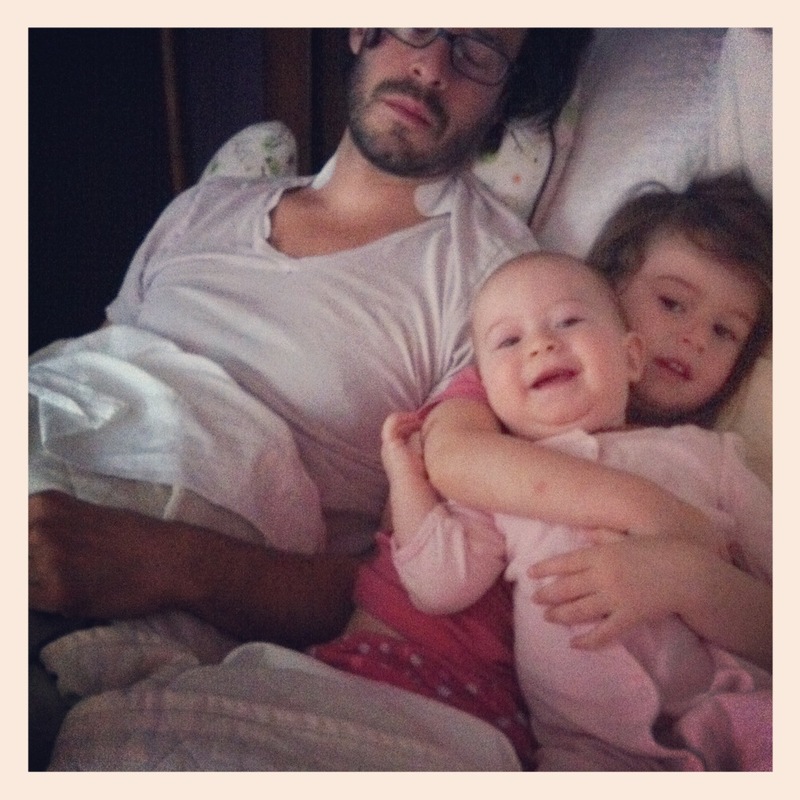 Sometimes Avi wakes up in the middle of the night and Richie takes her back into her bed and falls asleep with her. Sometimes Bar wakes up around 1a and I need to get up to pop the pacifier back into her mouth. Every night Bar wakes up around 4/5a hungry. One of us changes her diaper while the other goes to make a bottle. She drinks it and falls back asleep. Long story short: we're up a couple times every night. I remind myself: this too shall pass! What do you all do for your bedtime routine? Are you on schedules or more relaxed? Are your kids sleeping through the night?!? Happy Friday! Are you ready to party? We are!